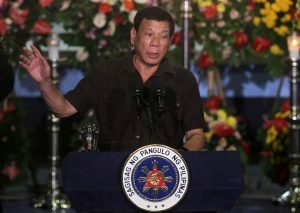 Philippines President Rodrigo Duterte publicly accused more than 150 judges, lawmakers, mayors and police officers of involvement in illegal drug trafficking on Sunday during a nationally televised speech in Davao City. He acknowledged that the list of officials accused may or may not be accurate, but said that as president he wanted to address a problem of illegal drugs in the country. Duterte fired the members of the military and police he named and ordered that security details be removed from the service of the politicians he accused. Most of the people accused were lawmakers or police, but the list also included eight judges and five generals, both serving and retired, the Associated Press reported. Neither the list nor Duterte’s speech detailed any evidence to support the accusations. Duterte, who earned 6.6 million more votes than his closest competitor in the presidential election and took office on June 30, gained support by promising to wage a fierce war on crime in a country previously plagued by corruption among law enforcement agents. Serving as the mayor of Davao City from 1998 until earlier this year, Duterte promoted harsh prosecution, including extrajudicial killing by police, for people suspected of involvement in the country’s drug trade. As president, he has continued to focus on drugs, a prevalent problem in the Philippines. Between June 30 and August 2, 420 people suspected of involvement in the drug trade were killed by police and vigilantes, The New York Times reported, citing local news organizations. Other outlets claimed higher death tolls in the five and a half weeks of Duterte’s presidency. More than 4,400 people have been arrested since he took office and more than 600,000 have turned themselves national police, fearing harsh punishment from the police, who who have been authorized to shoot to kill. During the run-up to the election, he swore to kill 100,000 criminals and dump their bodies in Manila Bay. Although Duterte’s campaign seems to have driven down crime, which decreased 13 percent since the election, his authorization of killings by police and death squads has generated concern from human rights organizations. Human Rights Watch urged the United Nations and other international bodies to condemn the surge in killings in a letter released on Tuesday, which was signed by more than 300 organizations. “With many more lives at stake, it is of critical importance for the UNODC and INCB as global authorities on international drug control to demand an end to the atrocities currently taking place in the Philippines,” the letter says, referring to the United Nations Office on Drugs and Crime and the International Narcotics Control Board.